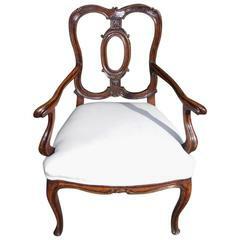 French Louis XVI period, pair of chairs in lacquered beechwood, circa 1780. 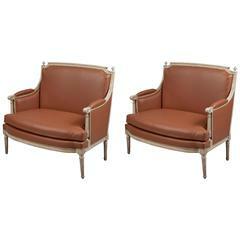 An interesting and elegant pair of chairs, with right and waisted assemblies, raised on fluted feet. 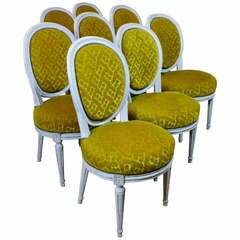 These chairs are an explicit reference to the architectural design, on whom were based on the French late-18th century magnificent decorations. Our chairs are close to a pair of chairs circa 1780, from the French finance department, and can be attributed to the production of Georges Jacob (6 July 1739-1814). Reference: Sièges en Société du Soleil à Marianne. Mobilier National-Manufacture des Gobelins Beauvais et Savonnerie. Dimensions: H 34.25 in. / W 17.71 In. / D 17.32 in. In fine condition, there upholstered with a new beautiful Italian silk fabric. In fine condition, there upholstered with a new beautiful Italian silk fabric. A good set of four Louis XVI period cream and gilt painted side chairs on hardwood frames, circa 1780, France. Solid frames in good condition with older but very nice upholstery. 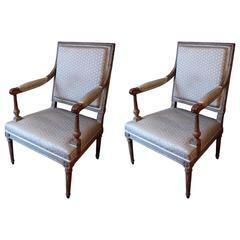 A pair of Louis XVI style chairs. 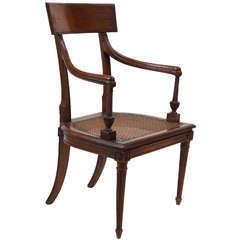 Hand-carved in beech wood with a classical lyre motif forming the the back rest and finished with a hand gilded, lightly aged and distressed, patina.